Here, the design techniques that are applied to minimize EMI emissions are discussed. Some ideas have been incorporated into designs and some must be implemented by motherboard designers. In Spread spectrum clocking the processor clock frequency is changed. Figure below shows the spread spectrum modulation spectrum which decreases radiated emissions over a wider frequency band. Therefore, instead of maintaining a constant system frequency, Spread spectrum clocking modulates the clock frequency. Spread spectrum clocking shows the reduction in peak radiation levels to reduce EMC. Differential clocking needs the clock oscillator to supply clock and clock-bar traces. To optimize the use of differential clocking, clock lines are routed parallel. 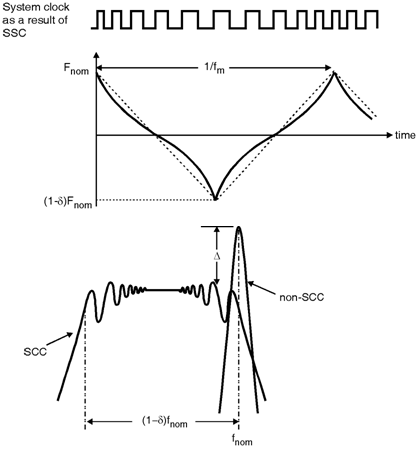 The reduction in EMI mainly due to differential clocking is because of H-field cancellation. Differential clocking also reduces the amount of noise coupled to other traces.